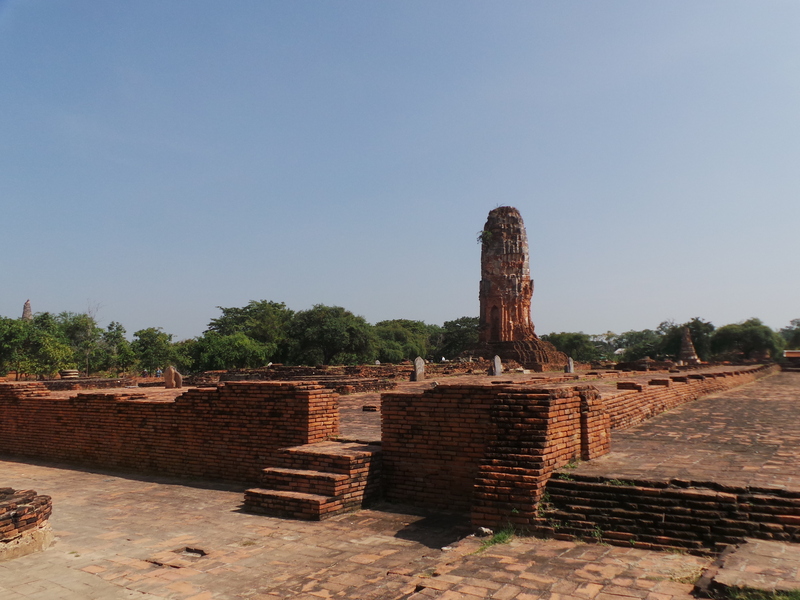 On the third day of my Thailand adventure, I was scheduled to head to a city full of history. 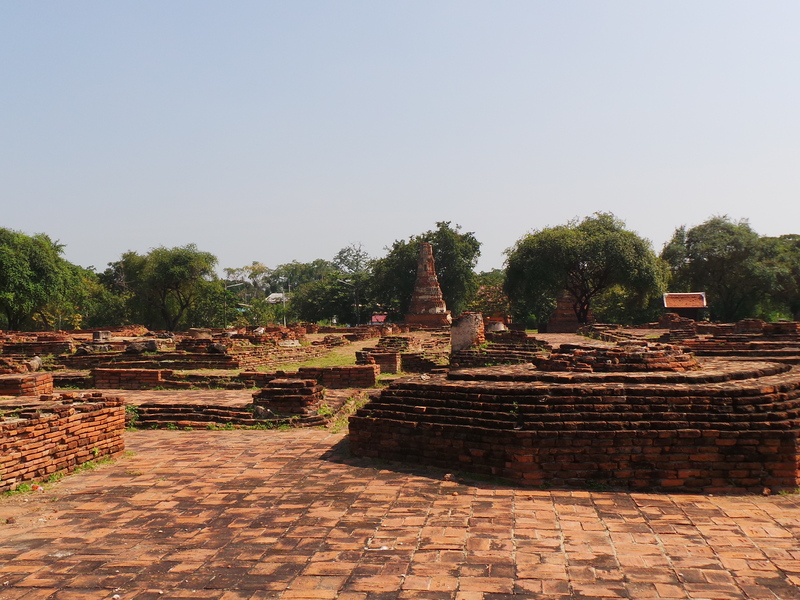 It is the historical city of Ayutthaya. 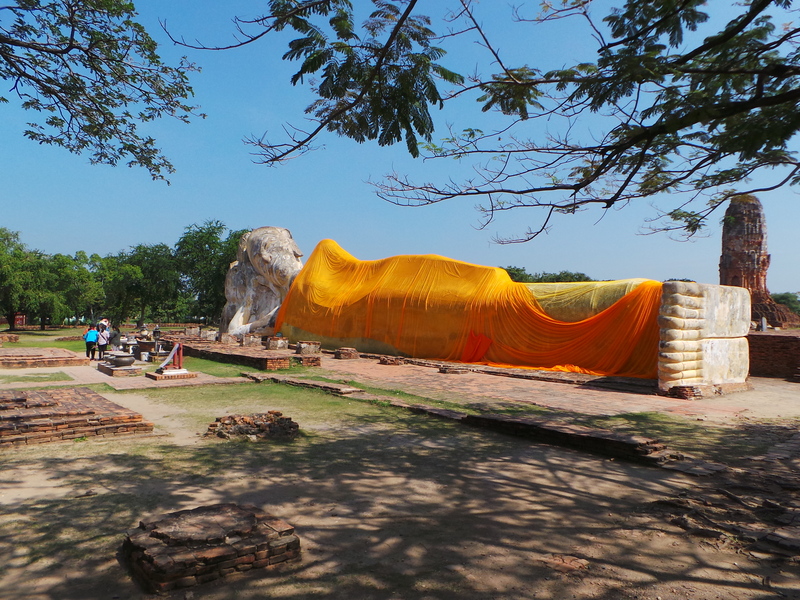 Located in the northern part of Bangkok City, Ayutthaya has been famous to all tourists with its unique antiquity. It has been established more than 100 years. It is rich in culture, history and drama. 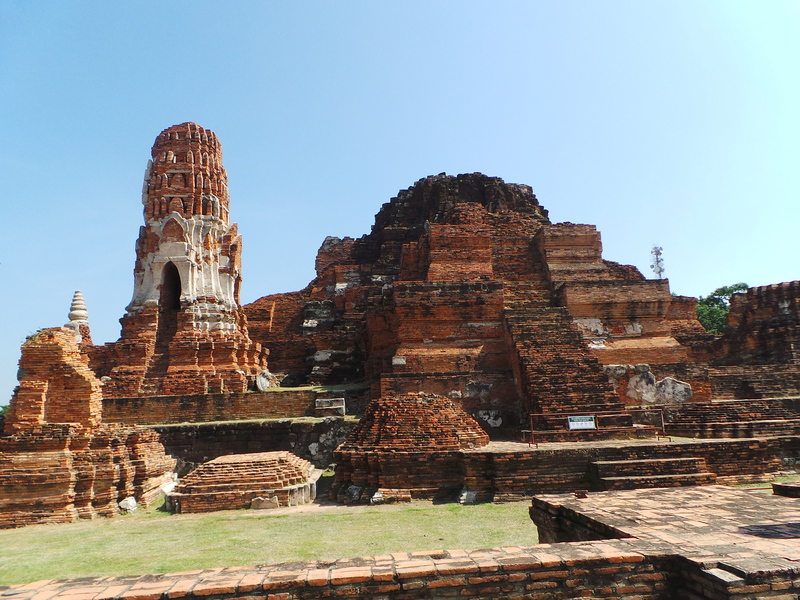 It is also one of the most important sites of the Kingdom of Thailand. The tour package includes a pick-up service from your hotel. Since I was in Sukhumvit area and a little bit far, so, I have decided to give another place for pick-up. My hotel was near DoubleTree by Hilton Hotel. Hence, they took hold of me there. It was around 0630H when the tour service arrived. Other tour participants were also being gathered at different hotels within the city. When everyone was all in the van, we went to the terminal of the tour agency which was in Khaosan Road. I was expecting those people inside the van will be my travel buddies but it wasn’t the case. There were more travelers outside and the staff from the tour agency separated everyone according to the package we purchased. I went to the van for Ayutthaya and they gave me a color sticker of yellow and blue and placed it on my shirt. When the group was ready, we left the capital by 0800H. 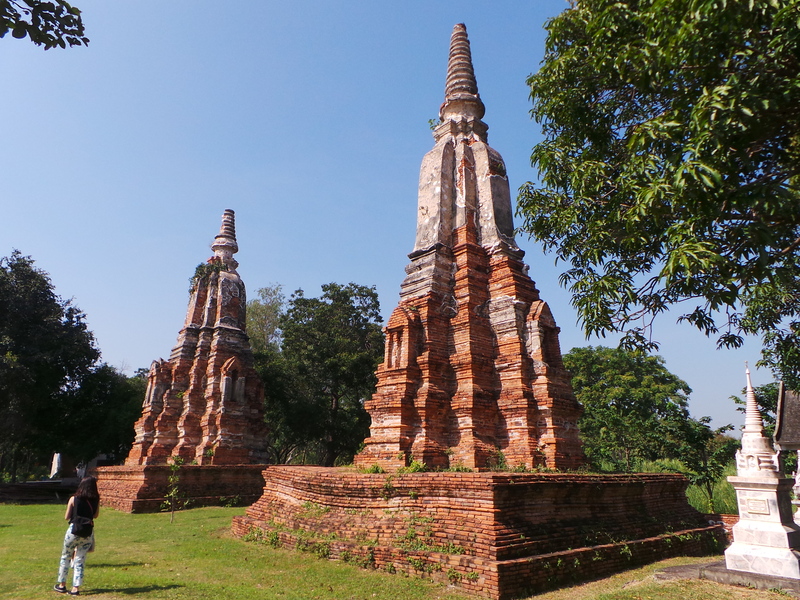 We traveled all the way to Ayutthaya which is known as the second capital of Siam and has been famous with ancient temples and ruins. It was about an hour and a half trip and we got there around 0930H. The tour guide introduced herself. Her name is Pha, nevermind the whole name coz it’s long. We went out of the van and there was another group who joined us. Our first stop was at the temple called Wat Phu Khao Thong. 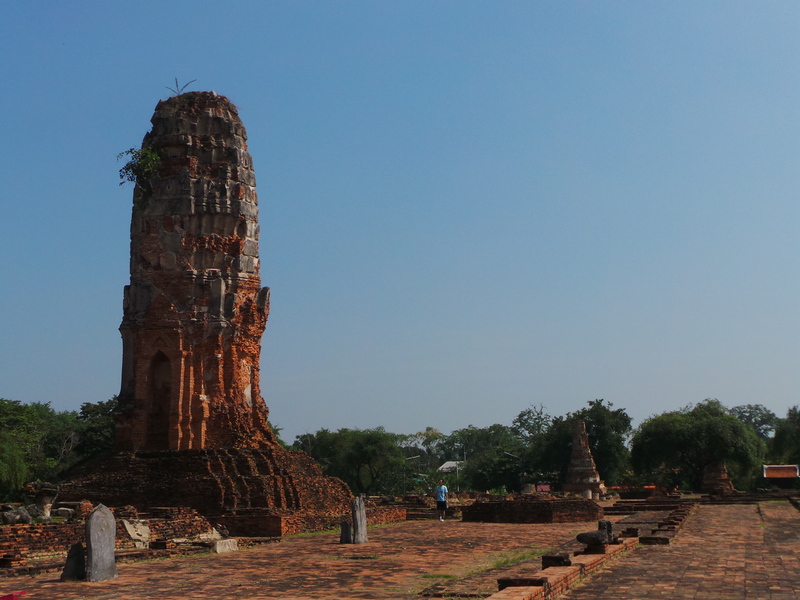 Wat Phu Khao Thong is a massive white-grey landmark in the province of Ayutthaya. In English, it is a Monastery of the Golden Mount. 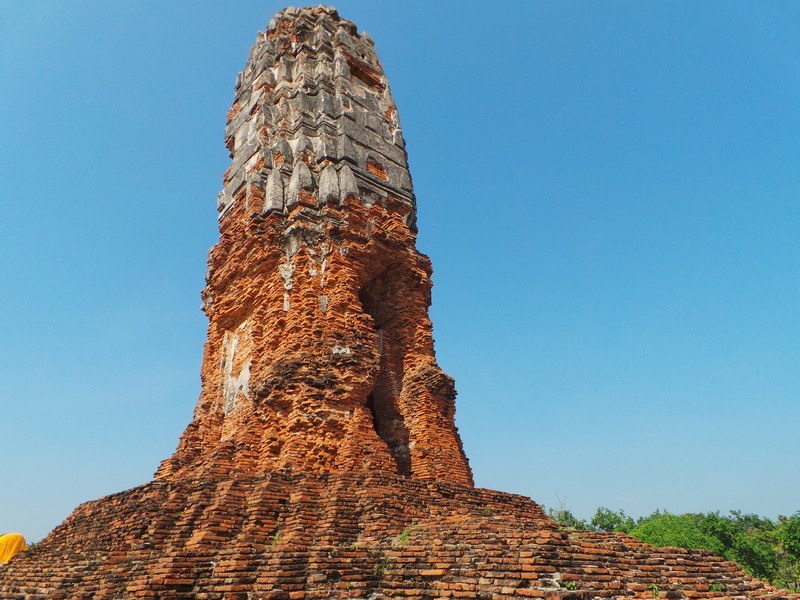 This landmark has been known as one of the highest chedis in northeastern part of Ayutthaya. 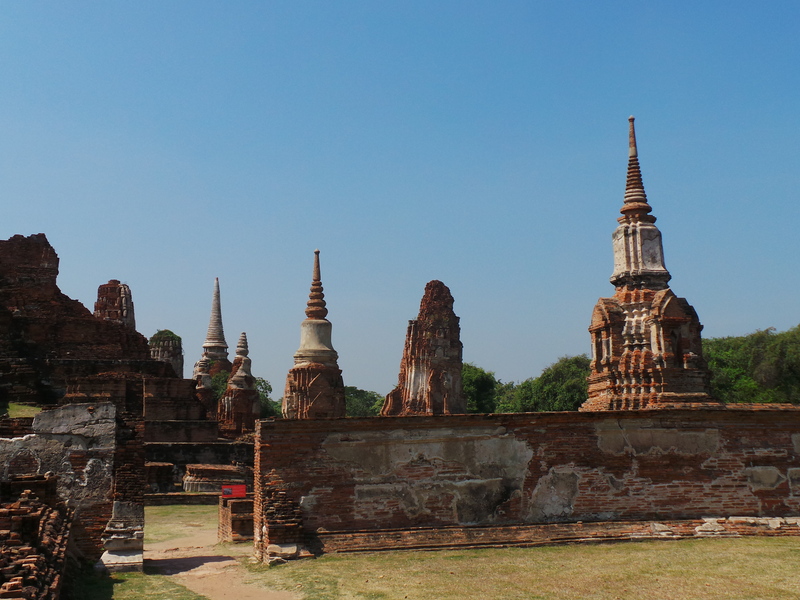 If you haven’t known, Ayutthaya has been one of the capitals of the Kingdom of Thailand. The country’s capital has been moved four times due to war, flood, fire, and rebellion as what the tour guide told us. We were given 45 mins to wander around. 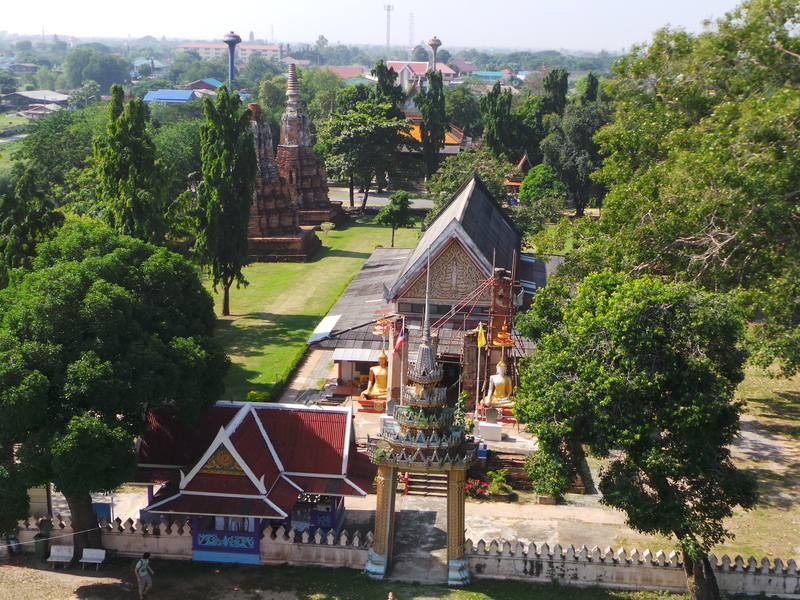 We were allowed also to get to the top view deck of the wat to get a panoramic view of the place. After Wat Phu Khao Thong, we went to another historical place. It took about 15 minutes to get there. 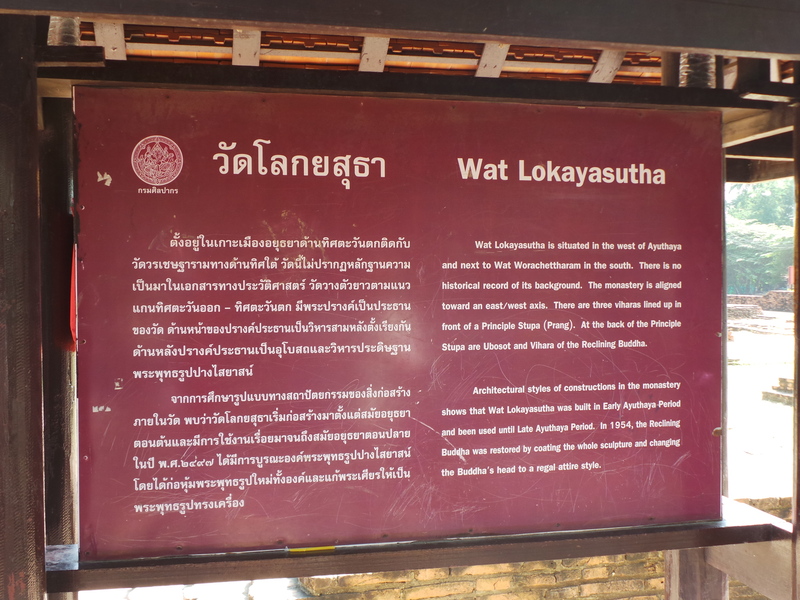 We arrived in Wat Lokaya Sutha. 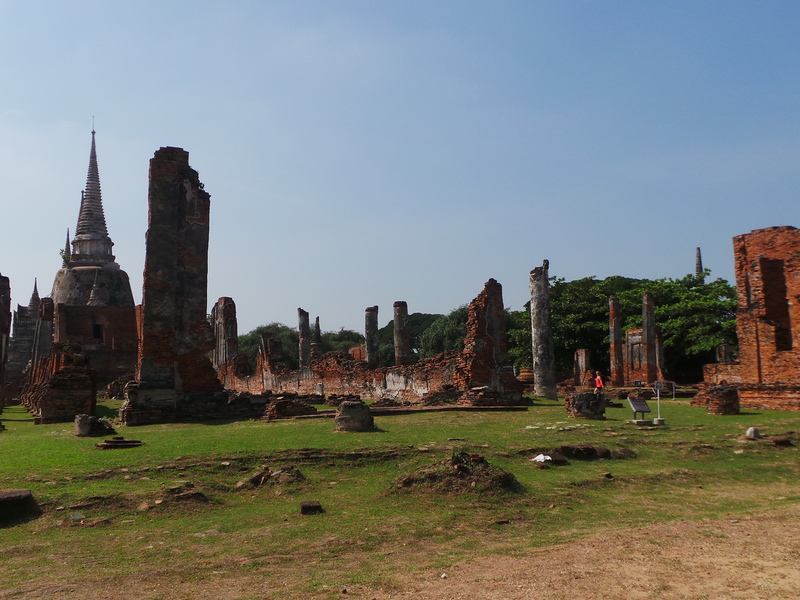 Wat Lokaya Sutha was once a massive temple complex but sad to say that all we can see were piles of rubble and ruins. 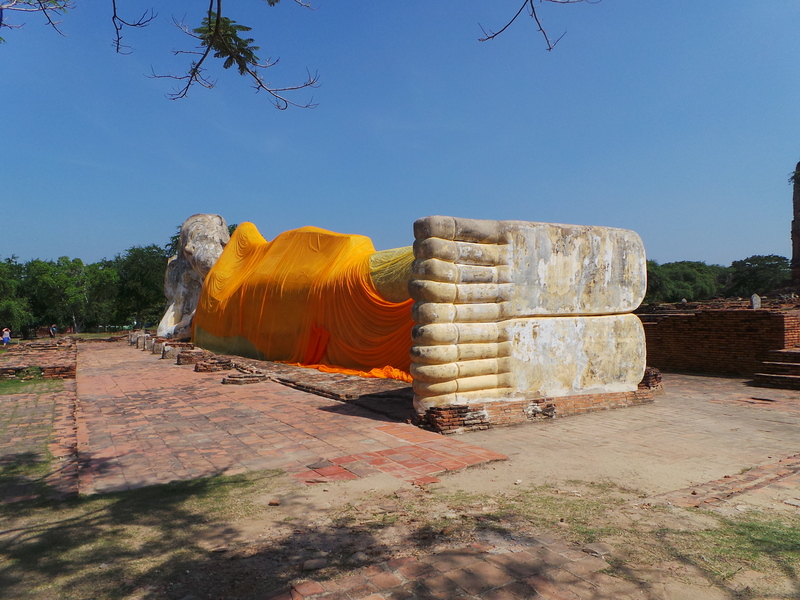 But what made it worth visiting is the largest reclining Buddha in Ayutthaya which is at eight metres high and 42 metres long, lying in an open field. 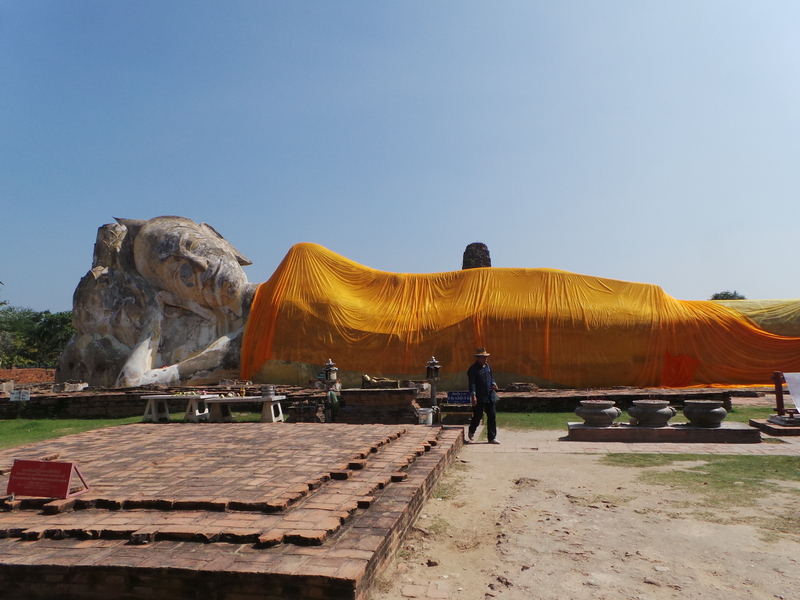 The difference between this reclining Buddha to that of Bangkok’s in Wat Pho is that the Buddha in Ayutthaya is sleeping. 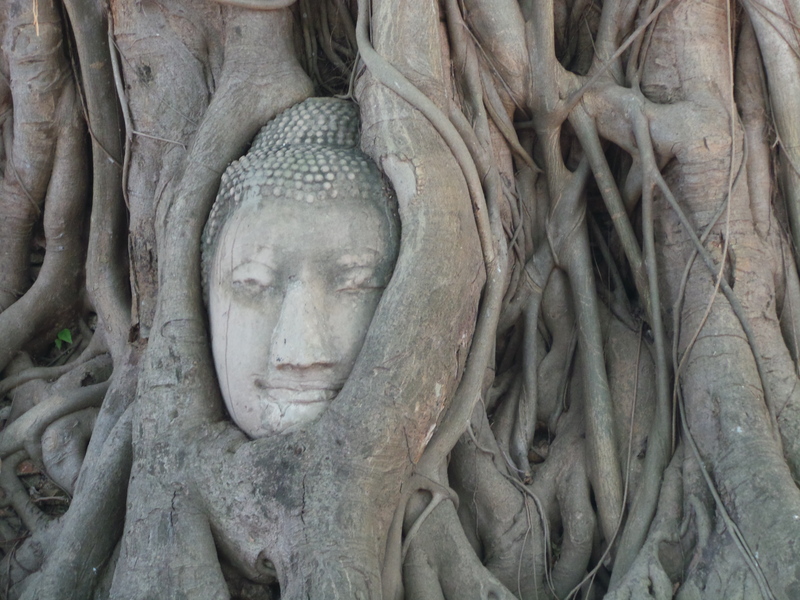 While in Wat Pho, the Buddha is about to enter nirvana. At 1100H, we went to another historical site. We got to Wat Maha That just half an hour. 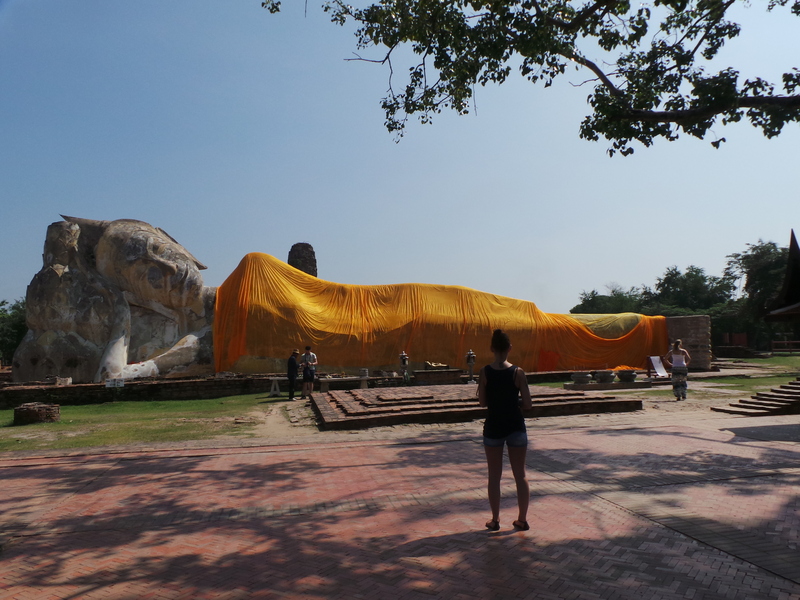 The tour guide told us the story behind Wat Maha That. 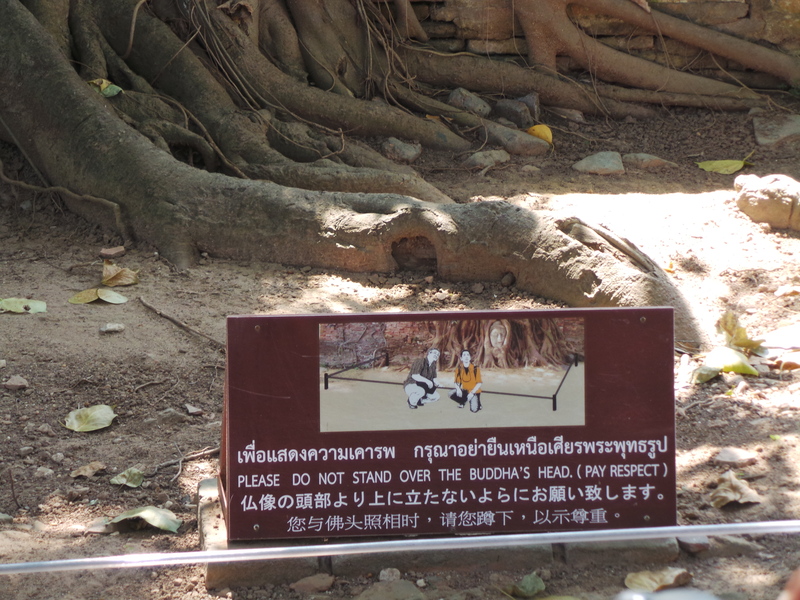 The story of the touristic highlight of the monastery which is the head of Buddha wrapped on roots of a tree. 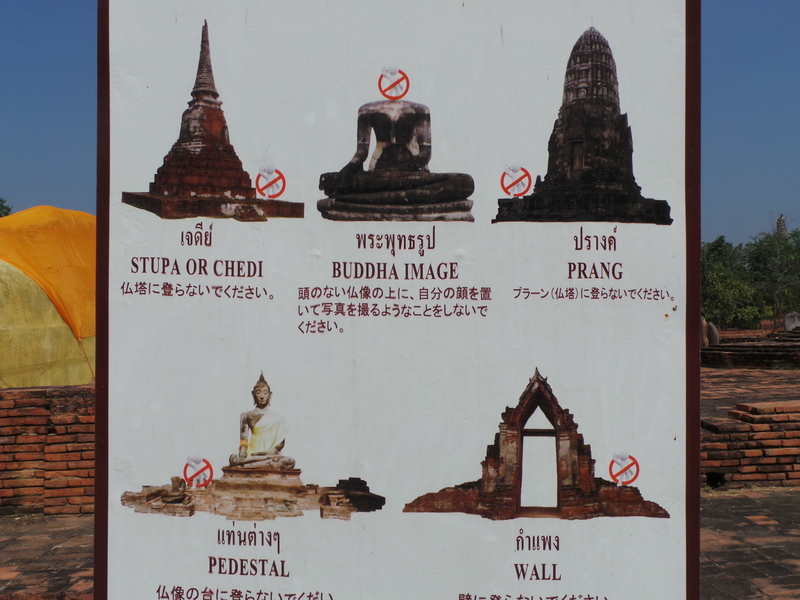 She also told us the do’s and don’t’s in taking pictures with the image of Buddha and that everyone should pay respect. Wat Maha That or in English, the Monastery of the Great Relic is one of the most important monasteries of the Ayutthaya Kingdom. 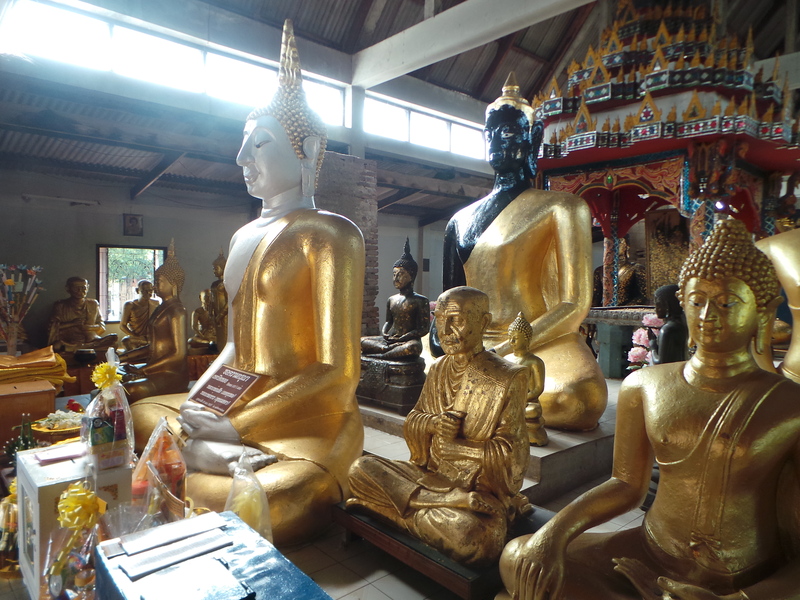 It is considered a religious centre since it has relics of the Buddha. 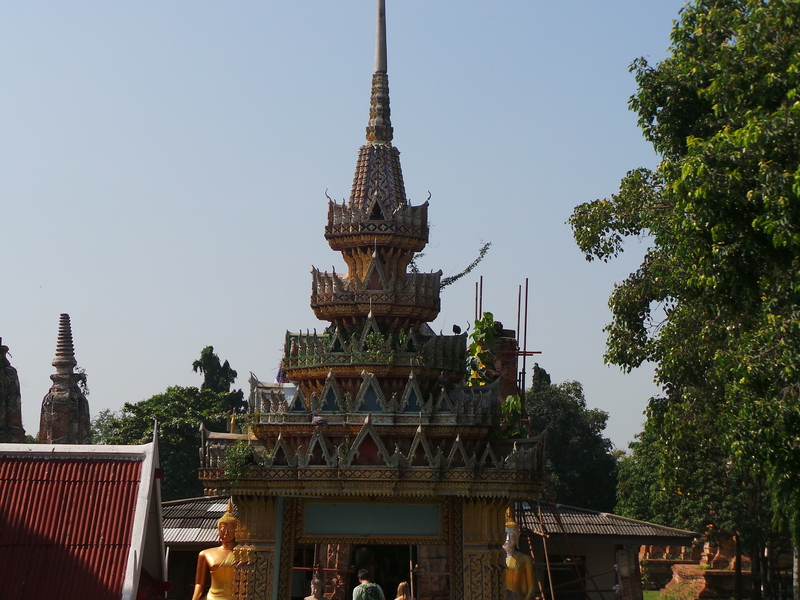 In the past, Wat Maha That has been the venue for important royal ceremonies. After Wat Maha That, we went in a local restaurant which was arranged already by the tour guide. In this restaurant, we were given an hour to have lunch and enjoy Thai home cooked foods which to my surprise were not spicy. 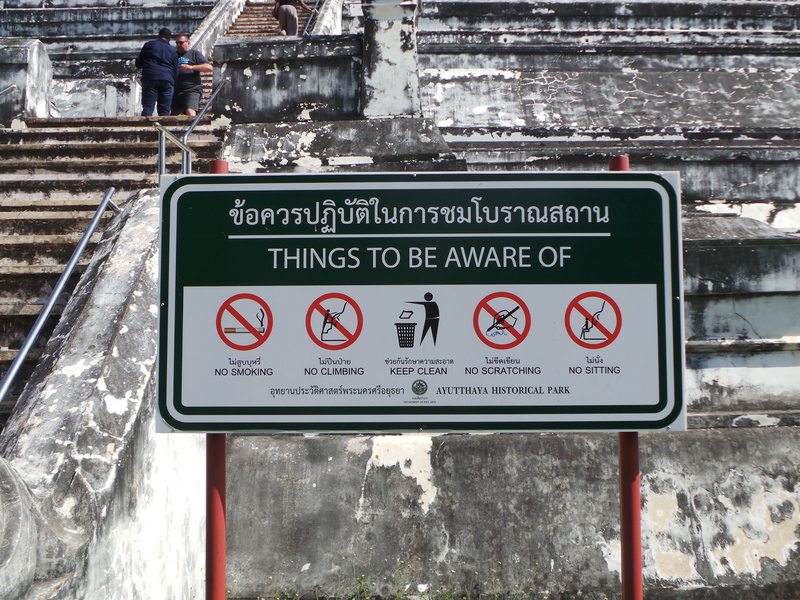 An hour after, we were called and headed to the next destination which is Wat Phra Si Sanphet. 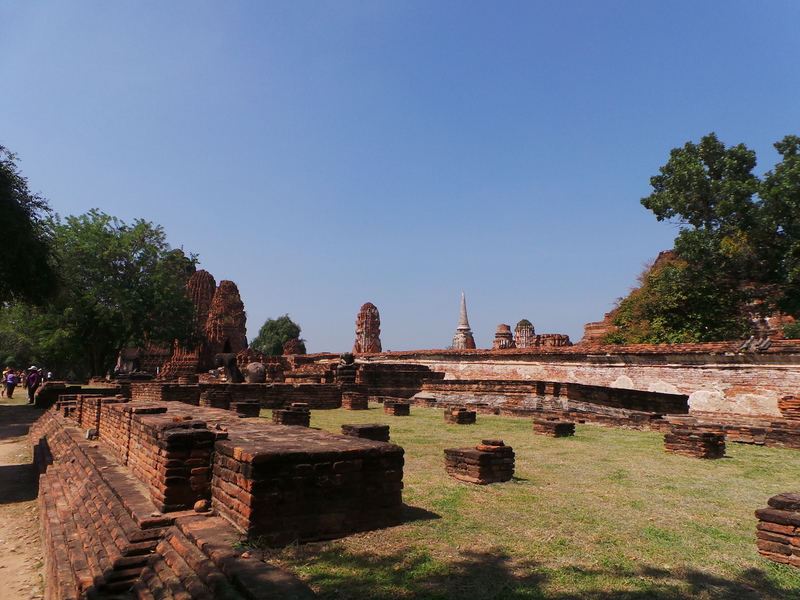 Wat Phra Si Sanphet is also one of the most important historical sites of the Ayutthaya period. 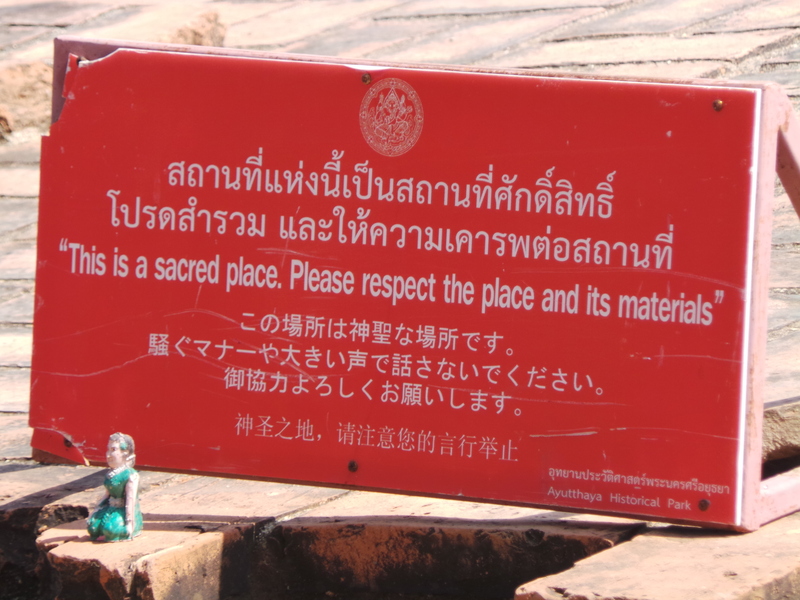 This is used to be the model of the Temple of the Emerald Buddha in Bangkok. 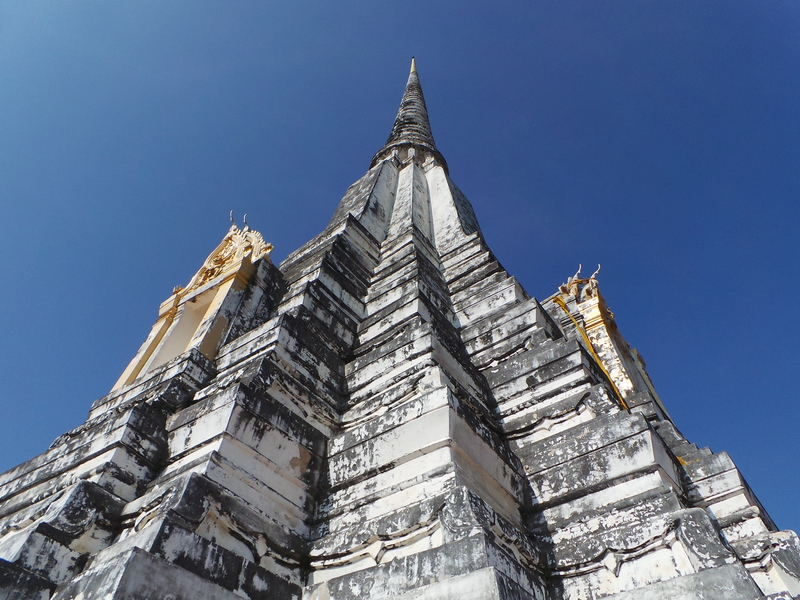 When touring Wat Phra Si Sanphet, you just imagine the Grand Palace and Wat Phra Kaew in Bangkok. 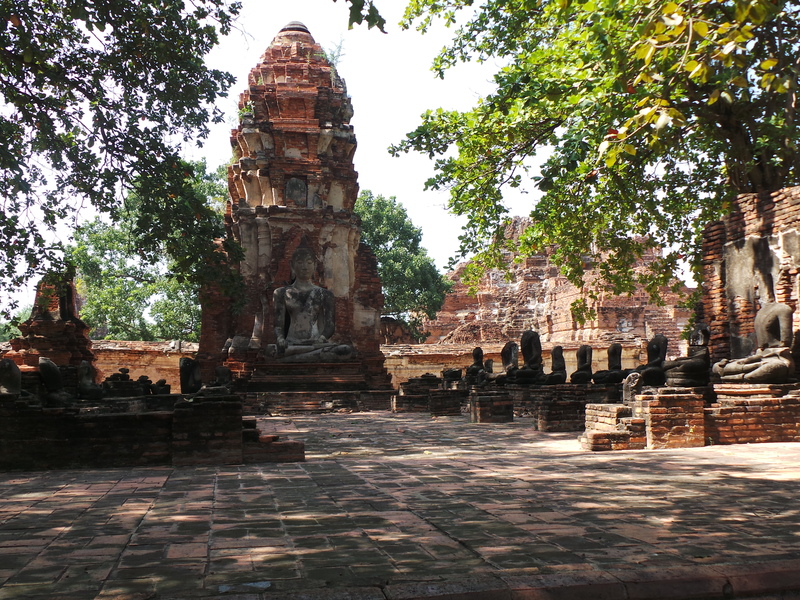 For those attractions in the capital city were taken from this temple in Ayutthaya. It took us about 30 to 45 mins to wander around the temple grounds after the tour guide gave us some little history about the place. Those 3 tallest chedis will catch your attention right after you enter the ruins. 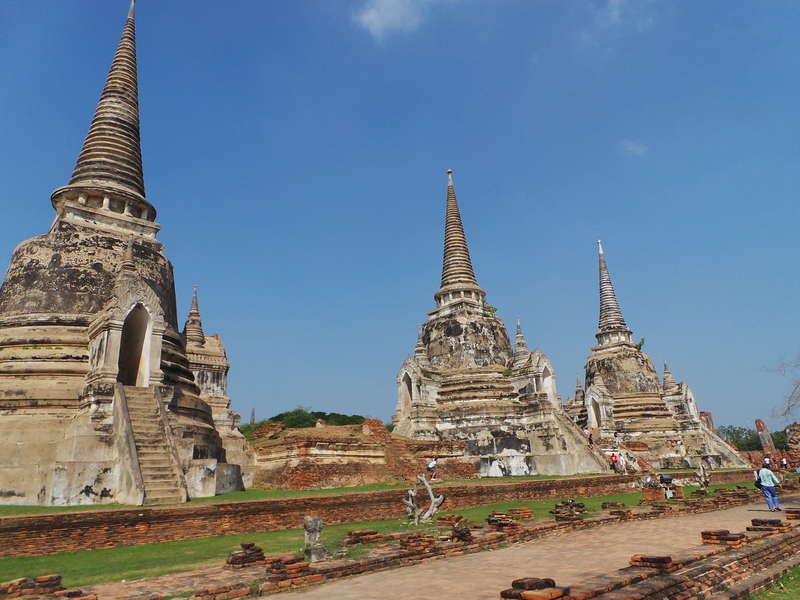 According to the tour guide, the ashes of the Kings of Thailand were placed on top of those chedis and every chedis around the grounds were the family members of the royal family. Thus, it is considered important and every people should show respect when in vicinity. 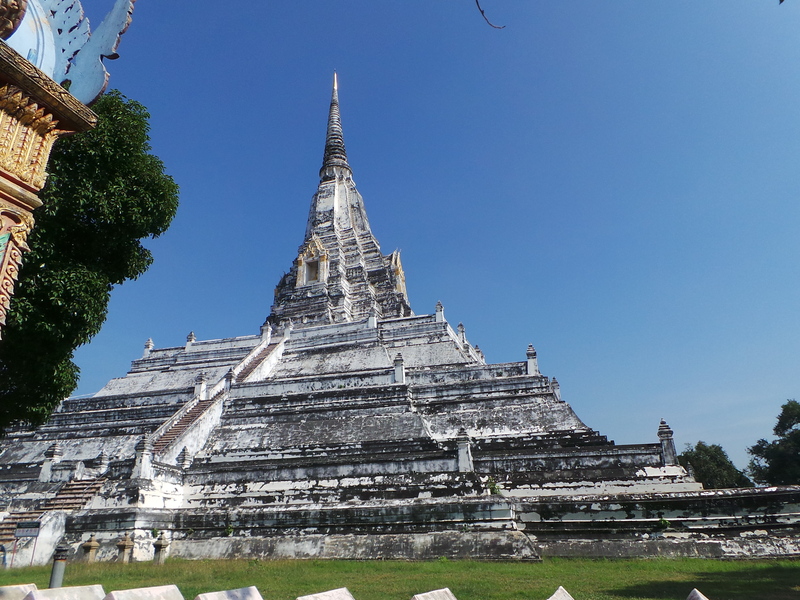 Right after visiting those temples, we then headed to the last destination and attraction in Ayutthaya. 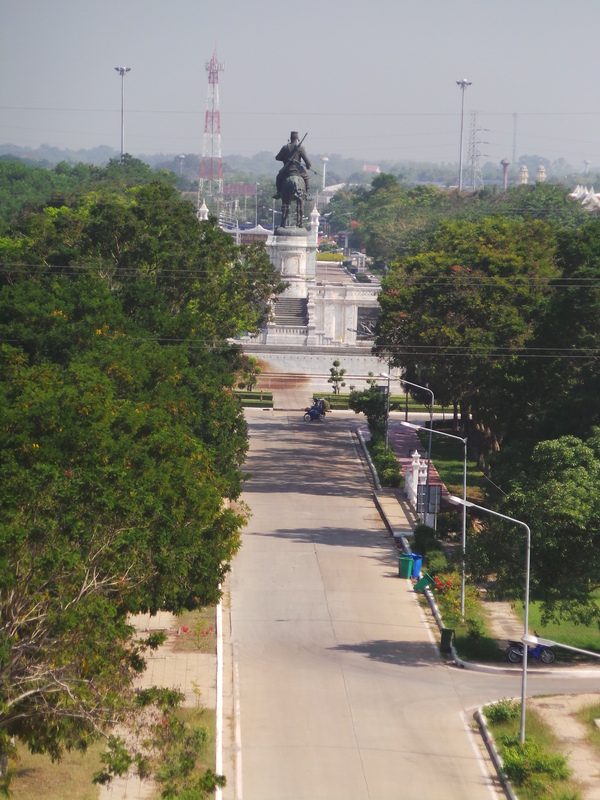 And that was the Bang Pa-In Summer Palace which I will talk about in my next post.